I cannot contain my joy any longer - I LOVE MY NEW BIKE! Okay, maybe I didn't need a sixth bike. Maybe I already lack sufficient space in my home to lean a bike, maybe it is only possible to pedal two wheels at a time, which leaves 10 wheels idle at home -- but I love my new bike. It has changed my life. You know the old story of how you can never change a person, or how sometimes we cannot change ourselves until we are forced to do so? Well I give credit to my brand new bicycle for wrapping change in one big blanket of love and pleasure. 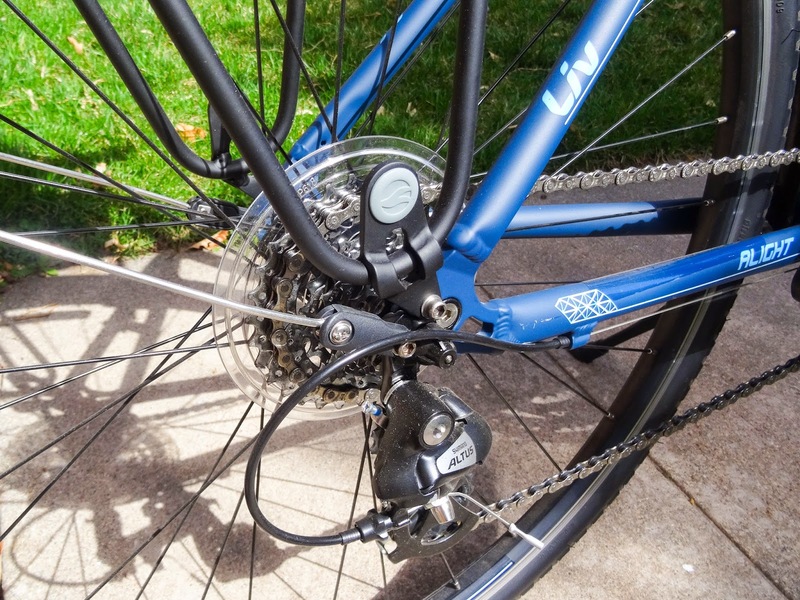 Yes the bike matters, and it might not be the bike you expected. For me, change came at a price of $575. No I did not leave off the last zero. This modest machine has everything I want in a bike and I happily ride it everywhere. In fact, I think of places to go, simply so that I can ride this bike. Do you want to see it. It's a Giant Liv Alight City (2015)! It's perfect. 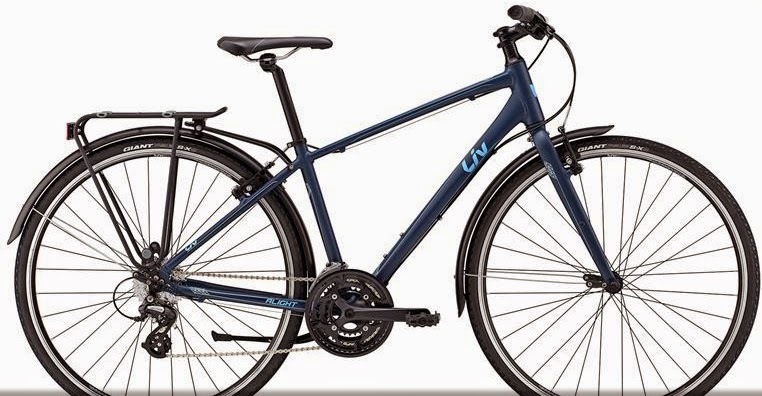 It has a matching bike rack and fenders included in the bargain price. It has a bell, which I happily discovered while trying to shift gears. 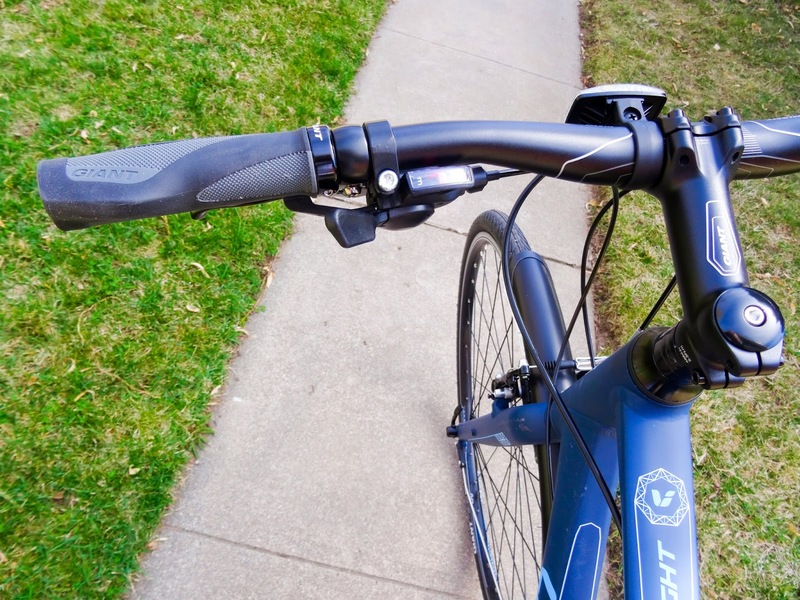 It has really nice handlebar grips. It has a pie plate (not featured above). I am pretty sure I was 8-years old when I last had one of those on my bike. It has a kickstand! I bet you can't even remember how convenient those are. Actual full specs which proves it has a fork and crankset and spokes and other important stuff. After years of focusing on $6500 bike frames and $2500 wheelsets and $250 saddles, and top of the line components, I swear this bike brings me - I dare say - more pure joy than almost any bike I own (okay I admit they ALL bring me joy, that's why I need six). There is no such thing as junk miles or intervals on this bike. I ride it how I want, where I want, when I want. I zoom, I float, I smile. And the world around me has changed. 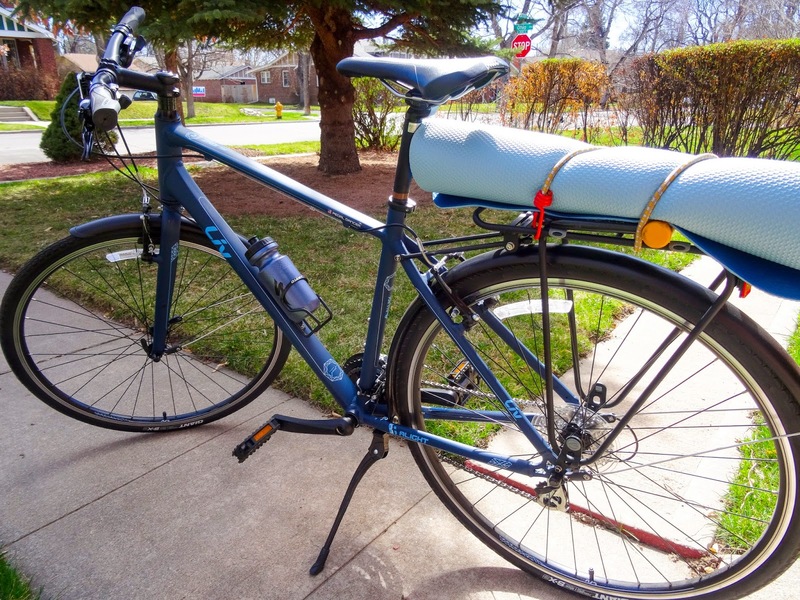 Since the introduction of this fine machine into my life, I have noticed tons of other people in Denver riding bikes in t-shirts and pants and sandals, riding whatever rolls on two wheels, riding no matter the weather. And - they are all smiling. Smiling on a bike! Apparently there is pleasure in cycling. It's happening out on the roads of Denver, Colorado every single day. And I am out there with 'em. The other good thing about this bike is that I do not need to wear a $195 Rapha road jersey to pedal in public. I can be so bold as to wear a hoodie and yoga pants (on my way to yoga class, of course) and feel just fine about my identity. Also, true to my character, I researched city bikes for two years to find just the right bike. This is the one. I did make it out for a ride on my standard road bike this past Sunday. It felt like the bike weighed about 4.5 pounds under me, light and zippy in comparison .... but I missed having a bell. 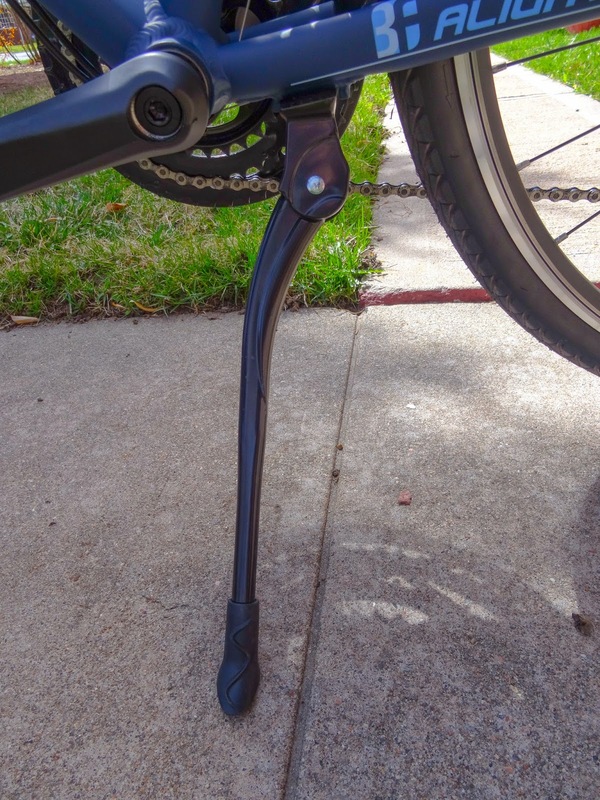 And a kickstand. A plastic pie plate; I'll keep it until it cracks off. You kick it, and the bike stands. It's a yoga mat carrying machine. A very friendly handlebar with a hidden bell. Happy dog to greet me upon my return from Pilates Class (not included). Life is good. I love my new bike! 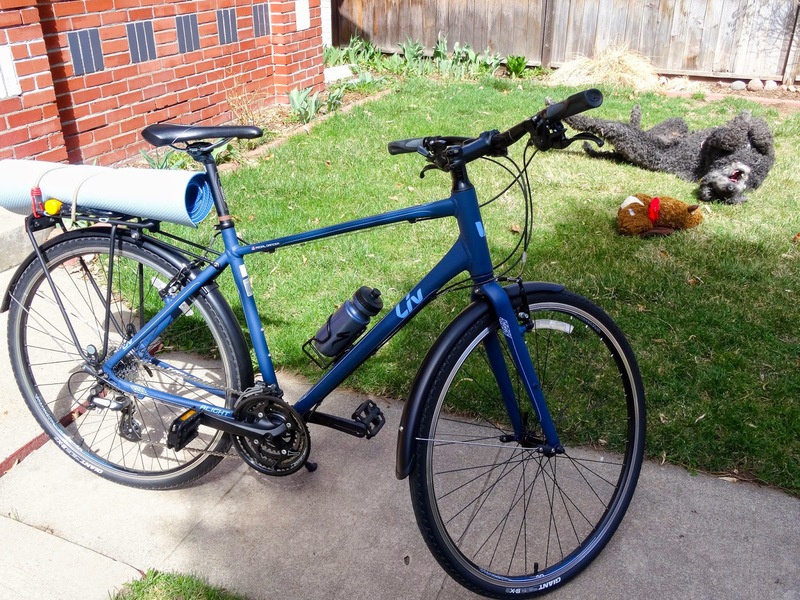 I bought my bike at Giant Denver in the USA.